Jess Day and Nick Miller complement each other in many ways. She’s got ambition; he lacks initiative. (Except when he finds it, at which point she’s extremely, hilariously attracted to him.) Nick is the one who plants his feet in reality, while Jess is the dreamer. The through line of the characters’ dating relationship concerns the ways in which they’re inching each other toward adulthood, putting tape (or quick-hardening caulk, as the case may be) over the broken parts of their personalities. 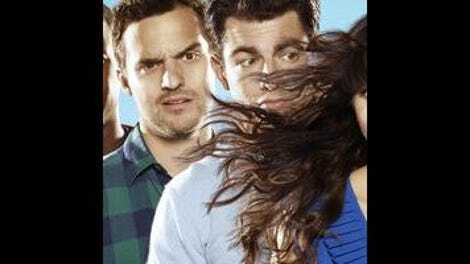 But New Girl also illustrates the overlaps in those personalities, and “Fired Up” brings up a big one: The show’s central romance is between a couple of pushovers. Not that there’s anything wrong with that—sitcoms needs pushovers. It needs the type of guy or gal who stands by while bolder figures take decisive action, possibly offering up some variation of “Are you sure this is a good idea?” It’s an outgrowth of the straight/absurd dynamic that’s essential to all modern comedy, a pushover/bulldozer arrangement that New Girl uses to its advantage by occasionally making bulldozers out of its pushovers. As such, it was thrilling when Nick summoned the courage to kiss Jess in “Cooler”; it’s similarly thrilling when Jess seizes the opportunity to become the vice principal of Coolidge Middle School in “Fired Up.” It’s then funny when that newly acquired responsibility means she has to fire Coach, and funny-thrilling when she stands up to Dr. Foster in order to reinstate the once and future Coach Coach. (Sorry: Coach Coach. With a little lift on the second “Coach.”) New Girl’s flexible like that, and when it really leans into a plot, the best material comes from the characters wriggling out of a scenario they were to afraid to say “No” to. Or if they’re Coach or Schmidt, something they’ve too vigorously agreed to. Where does that leave Winston? Who knows? Also: Who cares? Watching Lamorne Morris come into the role of “Winston the weirdo” has been one of the most consistent delights of season three, and part of that means giving up on wanting to give the character the kind of sharper definitions laid out above. He’s just Winston, this comedic sharp shooter who’s served best by bits like the attorney cosplay in “Fired Up.” The police-academy thread is on hold this week, as Lamorne Morris explores the other side of the Law & Order equation, embracing douchebag-lawyer cliché and handing out business cards that are actually baseball cards. Earlier in the series, this might be reason to call foul, but you know what? Morris looks like he’s having a hell of a time in “Fired Up,” and he runs away with the episode because of that. He’s found a freedom in this position, a wild-eyed conduit for his Second City-reared liveliness, and he’s taking ownership of it. He’s the eccentric oddball, the guy whose unknown piano chops become known just because there’s a piano in front of him. He’s a natural fit for the sort of zaniness that New Girl used to force on Zooey Deschanel, and episodes in which Morris gets to fully indulge in this side of his character are a lot more fun as a result. It’s important for that sense of energy to be present on the set in “Fired Up,” the first episode of New Girl directed by the show’s lead editor, Steve Welch. Welch cut his teeth (and won an Emmy) on Malcolm In The Middle, and I’ve always found his work in the editing booth to be this show’s best source of pep. The goal of a TV director is to make a mark while remaining largely anonymous, so the distinctions between “Fired Up” and, say, a Max Winkler episode or a Jake Kasdan episode are minute. But Welch’s editing work demonstrates such a grasp of rhythm and timing that I couldn’t help but seeing little moments of that in his direction. 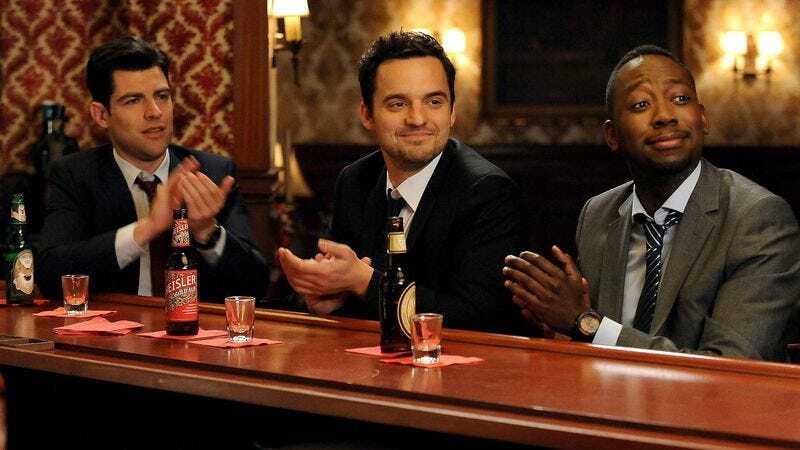 That’s especially true in the scenes between the old-school New Girl trio of Morris, Jake Johnson, and Max Greenfield, when the well-honed chemistry between the three actors gives a built-in boost to Welch’s direction and Sophia Lear’s script. Bringing Schmidt back to the loft is a bit of a cop-out, but I sincerely missed the kinds of scenes that come out of the planning and execution of Schmidt’s legal defense, and I wouldn’t mind more frequent visits with the three knuckleheads rooting for Cece when the underage Aussie returns to the bar. The scenes between the newly minted bartender and her illegal patron come across like the panicked realization that Hannah Simone didn’t have anything to do this week, but they get a pass for now because a.) They created a reason to bring Ben Falcone back as Mike, and b.) They’re part of an incomplete story. Their true purpose (and true worth) won’t be known until next week. As New Girl’s preeminent bulldozer, Damon Wayans Jr. does a lot to keep the energy levels up this week as well. He’s the great motivator among the roommates, the one who can actually reach people because he’s not as self-involved as Schmidt. I feel as though New Girl tried to combat a tendency toward onset sluggishness earlier in season three by tasking its principals with YELLING EVERY OTHER PUNCHLINE; it wasn’t the right tone for the show, but I wonder how that would’ve changed if Wayans was around at the time. He’s such a big, electric presence that Coach’s louder lines don’t just feel appropriate—they feel necessary. Having him around has presumably made it easier for Morris to transition into his utility infielder role, too: For whatever reason, the show’s staff writes more comfortably and confidently for Coach. Maybe it’s because his nickname is also a description of his general disposition, a shortcut to personality and comprehensible relationships with the other roommates that’s repeated any time another character calls out to him. It’s a move cribbed from The Smurfs, but it works. But if Coach can’t also work his motivational magic on Nick, will assertive Jess leave her passive boyfriend—who can’t demonstrate that he’s quick on his feet because he forgot the word feet—in the dust? Or will this turn into another instance of the couple’s complementary nature? Jess has always preferred the version of Nick that has a spine, and that certainly wasn’t the guy who showed up to represent the law firm of Cooper, Bishop & Ferguson. The chair gambit and threat of paperwork worked out in the end, but he had Bishop standing right there and still identified him as Ferguson. (I’m still parsing out whether or not this was Nick taking leave of his senses or a plan not to call Winston by his real name. Either way, I love how Winston rolls with it.) Nobody earns a lasting relationship; for that kind of thing, you need to show your work. A little after-the-fact grade changing: I realized I like this episode a lot more than “Sister III,” so I bumped that one back to a B. Considering how Curtis Armstrong spent his time on the big screen in the 1980s, it’s funny to see him play an authority figure on New Girl. An authority figure who’s after the hearts of Booger from Revenge Of The Nerds or Miles from Risky Business, but an authority figure nonetheless. We’re off next Tuesday, March 18. But when New Girl returns, so returns True American. Break out the Old Glory shot glasses, and brush up on your presidential cabinet members.